· ➤ (One takeoff/landing key) The quadcopter is equipped with a take-off and landing key, which makes the aircraft easier to fly and better for beginners control. 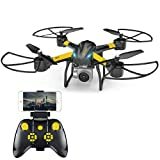 · ➤ (Longer flight time) Equipped with a high capacity 1800mAh battery, it offers a flight time of up to 18 minutes (when not carrying the camera). With the 720P Wi-Fi camera you can enjoy your flight better. · ➤ (Adjustment Speed Adjustment) You can choose a speed according to your operating capacity. · ➤ (What you can get) 1 x drone, 1 x transmitter, 1 x camera, 1 x USB charging cable, 1 x manual, 4 x small blades.